More fooling around with triptychs and bright colors. I really like the blue-violet with the yellow-orange. This is an Asian small clawed otter, in case anybody's keeping track. They generally only come in brownish-grey, and while they are adorable, they also produce a stench that would knock a cow back on its heels. I did not know that bout those little guys. cute!! i loveeeee otters!!!!!! beautiful colour too!!! I really like those colors, too. Coming over from a previous account to fave this again, because it still blows me away! The otter is my spirit animal. I this piece. Thank you! Fantastic! Amazing! 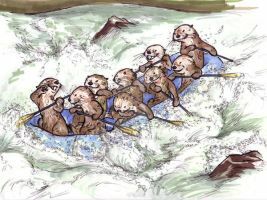 You really captured the playfulness of the otter, and the bright colours are a great way to bring that out. Also, I love all the textures. Aaaahhh brilliant! Of course, the colours and all, that just makes it that much greater ... but the composition, and the fact that it looks real/so cute! very well done! Absolutely gorgeous colors -- so vibrant! And of course it helps that otters are just about my favorite beasties ever. This one has a beautiful lithe playfulness to it. Lovely work. If I may ask, I'm curious how did you make the otter part - are these three panels glued to the surface or it's just carefully painted? YEY bought this one at Anthrocon, wasn't aware there was an asian otter, and wasn't aware it would stink so bad lol. I thought it was just standard River Otter. The ones in the Minnesota Zoo didn't smell that bad - noticeably musky, but not hold-your-nose-and-run. I suspect it depends on the otter's mood, mating season, etc. People tend to forget that they're related to skunks. is it ok if i replicate this larger to hang over my bed. i just went to the chattanooga aquarium and there were otters and i feel in love,and this design just screams playfulness.It would not be for sale its just that you captured they're personality so well. ...Someday, I am going to have the money, and you will end up being that much richer, while I decorate my dorm with prints of phalloi, otters, and Saint critters. Yeah, the colors look great, and I like that the panels aren't the same size. It's adorable, and I love the colors. Cute! And I like the triptych look this has. o.O i wantses, shame the original sold *goes sees how much the prints are* I love otters and this one seems even more adorable in blue. Cute I like the color contrast a lot! And the blue is so beautiful on him. Don't care if it's stinky, it's adorable! Anyway, I like what you're doing here. The colors are awesome. Such a cutie! I like your use of colors here, very cheerful. I love it, its so cute! They are one of my fav animals... do they really stink? ahhh... a water ferret... me like. Awww, so cute. Too bad they don't really come in blue. Ohh asian otters. Asia has some nifty animals. Great work! I absolutely love the colours!! I like the contrast between the blue and the yellow. I like how the fur turned out. I fear the National Zoo disagrees with you! I fear you may be looking at an Americanism which due to experience would lead me to agree both sides of the Altantic may forever have to agreed to disagree. Haha oh well, I've photographed them hundreds of times and over here the accepted term in all zooz is Short-Clawed. I have to agree with you about the stench. My family visited the Atlanta Aquarium recently, and their exhibit was usually the least crowded part of the entire building. Didn't keep us (and everyone else) from cooing about them, though.